HAL’s CMD Suvarna Raju has revealed that Final Operational Clearance (FOC) of TEJAS light fighter would be achieved by mid-2018 conservatively. Various parameters are being proven and envelopes including Angle of Attack (AoA) being explored, air to ground weapon delivery trials are complete with several software upgrades; the braking issues, for instance, have been fixed. It is worthy to note that the TEJAS program has completed more than 3,960 mishap free test flights. Derby BVR has been test fired with integrated air to air engagement along with the radar, the Python-5 Close Combat Missile (CCM) integration has reportedly faced problems and the Air Force has reportedly abandoned the project. MBDA as an alternative, has offered the ASRAAM CCM for integration with the Tejas. ASRAAM would provide the Tejas pilot with ‘a first shot, first kill’ feature to take the uncertainty out of a potential dogfight. The Cobham Quartz radome with higher permittivity increases the detection range of the multi-mode radar, tests have reportedly shown spectacular results. Cobham also provides the retractable air to air refuelling probe which will be tested with IL-78 MIDAS in the coming months. The Gsh-23L gun manufactured by Ordnance Factory Board (OFB) is another crucial component to be proven for FOC clearance. The gun has already cleared ground trial on the LSP-7. Gun firing can spring up nasty surprises in the form of gas ingestion into the air intakes, vibrations and cracks which can affect other components. TEJAS Mk2 is an improvement over LCA AF Mk1 with higher thrust engine. This aircraft will have improved survivability, maintainability and obsolescence mitigation, major avionics upgrade, several other state of the art technologies are planned to be integrated. 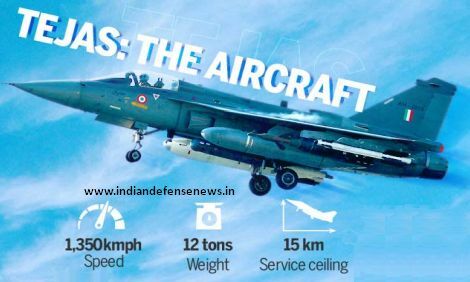 Future versions – the final operational clearance (FOC) model and Tejas Mk1A – are expected to pack the powerful punch the air force needs. The IAF eventually plans to induct a total of 120 Tejas jets – 20 each of the IOC and FOC configuration and 80 Mk1A models. The original requirement, projected in October 1985, was for 220 light-weight planes. India’s Air Force is already well short of the total number of combat aircraft it says are necessary to maintain a credible defence against its most likely opponents, such as China, which continues to grow its own advanced military capabilities, and long-time arch enemy Pakistan.